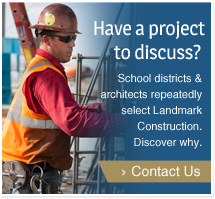 Since 1998, Landmark Construction has successfully managed renovation, site-improvement and new construction projects for public agencies, universities and K12 schools. Through collaborative project management, Landmark Construction has achieved a track record of 100% on-time project delivery within budget and without problems. Organizations benefit from Landmark’s experience in Lease-Leaseback, Design-Assist, Design-Build, Design-Bid-Build and construction management delivery methods. Learn why you can expect Landmark to exceed your expectations, especially when faced with tight deadlines, community needs, difficult sites, unique requirements and limited budgets. See inspiring examples of California public projects built on-time, within budget while overcoming seemingly insurmountable obstacles. Discover what clients say about Landmark Construction’s collaborative approach to problem solving, track record of achieving delivery goals and tradition of providing excellent customer service. Williams + Paddon Architects + Planners, Inc.